As an implant dentist, we offer this option for replacing teeth. Dental implants are an ancient solution to a problem that has plagued humanity since the dawn of time. From earliest recorded medical history, we know that men and women have lost teeth to decay, diseases and accidents. We also know that for equally long, those with a medical inclination, have been searching for and using innovative methods to replace teeth. Today, we have technology and dentists who are able to replace your teeth with skill and precision. We use the most advanced methods and materials to ensure that the replacement is as strong as the tooth that you lost. We do this using titanium. Why are dental implants growing in popularity? The answer to this question is quite simple: durability and esthetics. From an esthetic perspective, dental implants can give you a tooth that functions exactly the same as the teeth next to it. In essence, nobody can tell the difference between the naturally occurring teeth, versus the tooth you have had surgically replaced. From a durability perspective, using titanium has allowed us to create an implant that can truly withstand the test of time. 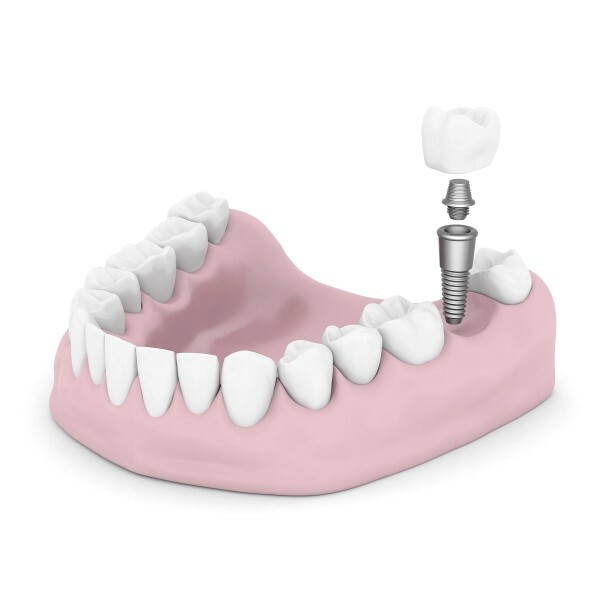 With proper care, and with the right conditions, a dental implant can last a lifetime. When you consider that no additional care is required of an implant and that you may not have to replace them for decades, it is clear why most implant dentists, patients, and even insurance carriers are now considering dental implant surgery to be an excellent way to resolve tooth loss or other serious dental issues. Using Titanium in dental implants sounds good, but is it a safe material to use? Medical professionals from all walks of life are now using titanium for replacement body parts. Titanium is being used to make everything from hip sockets to the tiny dental implant screws. The reason titanium is such a popular material for making medical implants are three qualities that make the metal especially conducive to biological purposes. Titanium is a non-corrosive metal which will prevent it from reacting to the oxygen in the blood, or any other fluid. This prevents rusting and makes titanium much safer than other metals. Titanium is a non-toxic material which means that there will be no toxic secretions into the bloodstream that can cause additional complications. Titanium is an inert metal. Simply put titanium will not react with any other chemicals in the body which once again works to its advantage in being a top choice of an implant dentist. Does titanium have any other benefits? As a matter of fact, the answer is yes. Perhaps the most spectacular quality of titanium, when it comes to implants, is titanium’s ability to bond well with natural bone. In a process known as osseointegration, titanium forms an almost natural bond with the bone, and there is very little risk of the body rejecting the implant. This also means that the implant will be as strong and able to bear the same amount of load as a natural root, which the implant replaces.